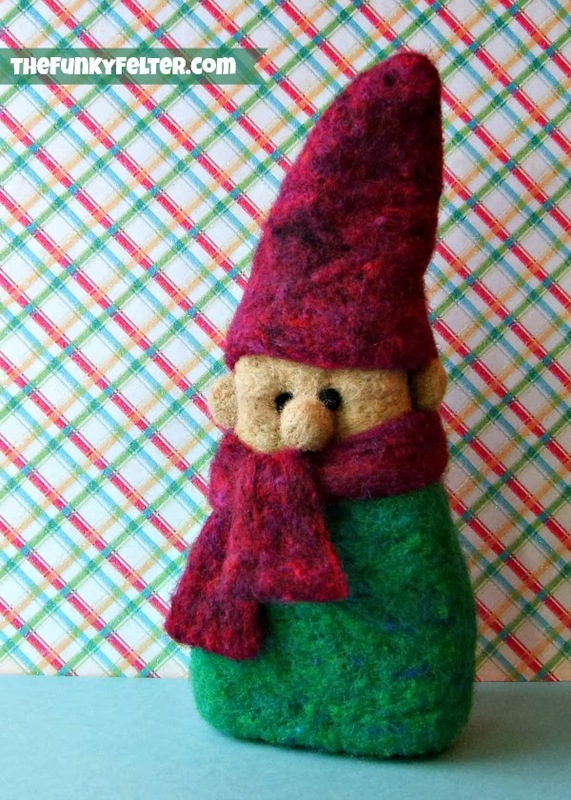 The Funky Felter: Make Your Own Needle Felted Elf for Your Little One! 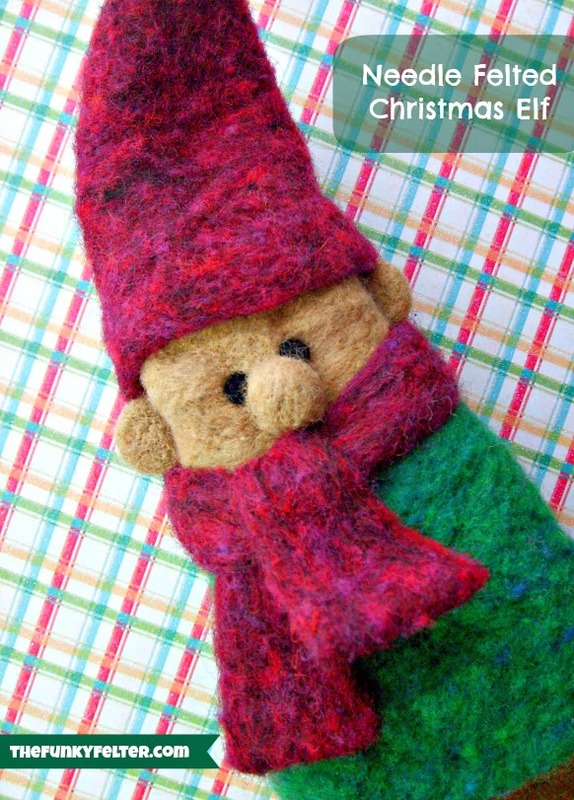 Make Your Own Needle Felted Elf for Your Little One! Do you have one of those popular elves on your shelf this season? I've seen a lot of people online, friends and acquaintances, having great fun with The Elf on the Shelf craze this season. It is such a cute idea and a neat way to get your kids and whole family involved in an activity together. My daughter just turned 4 years old this summer, and I didn't feel quite ready to introduce her to the branded story book and Elf quite yet so I decided to make her her very own little Elf. She got to watch me make him and be involved that way. And, I told her once I had taken a photo of him for the blog that he was all hers to play with. Maybe we'll try the official story book and no-touch "adopted" Elf like on the website next year, but I think she'll have plenty of fun with my handmade version this year and also like holding and playing with him too. Below is the basic construction method that I used for my handmade needle felted wool Elf. I didn't do step-by-step photos this time because I made it with my daughter watching. If you've made any dimensional felted objects though, this Elf isn't that difficult to construct with a thick foam base instead of using core wool. I chose the foam base because it was quicker to make, softer and more durable for my 4 year old to handle over time. First use the permanent marker to freehand draw a triangular shape on the rectangular piece of dense foam for the base. Use the serrated knife and sharp scissors to cut out the triangular shape. Also flatten and round off the top edge of the triangle for the head. Then cover the bottom 3-4 inches of the rounded triangle foam with green wool or fleece using the felting needle tool to felt it into the foam base. Use tan wool or fleece for the top couple inches of the triangle for the head and felt it in place. Use the felting tool to shape features like the nose, a small felted wool ball, and the ears, two small felted wool disks, for the face. Also use some small pinches of black wool to make ball shapes for the eyes. Use the felting needle tool to attach the facial features and shape it into the little Elf character. Then separately use the red wool or fleece and felting tool to shape a long rectangle for the scarf and a cone for the hat. Then attach both to your handmade Elf with the felting tool. This project took 3-4 hours total and was a lot of fun to make - mostly because I knew my daughter would enjoy it when finished. Next up, I'm going to attempt a snowman using the same construction method with photo tutorial pictures for it so be on the lookout for that craft project on the blog in the next few weeks. And, yes, the snowman will go to my daughter too when finished. She specifically asked for me to make that one. I hope you are enjoying all your Holiday traditions this year with family!